Afternoon Tea at The Wolseley is a true treat for any special occasion. This E-Voucher invites two to enjoy the experience. Sent immediately with your order confirmation email. Valid for 12 months. Redeemable at The Wolseley, 160 Piccadilly, London only. Orders are placed subject to our Terms and Conditions. Your recipient plus guest can enjoy Afternoon Tea Monday-Friday 3pm – 6.30pm, Saturday 3.30pm – 5.30pm or Sunday 3.30pm – 6.30pm. Our Afternoon Tea menu includes Assorted Finger Sandwiches, Fruit Scones, Pastries and a Choice of Teas. Alternatively, the E-Voucher can be redeemed during any other service (to equivalent value of £29.75 each or combined value of £59.50). Valid for 12 months from date of purchase. 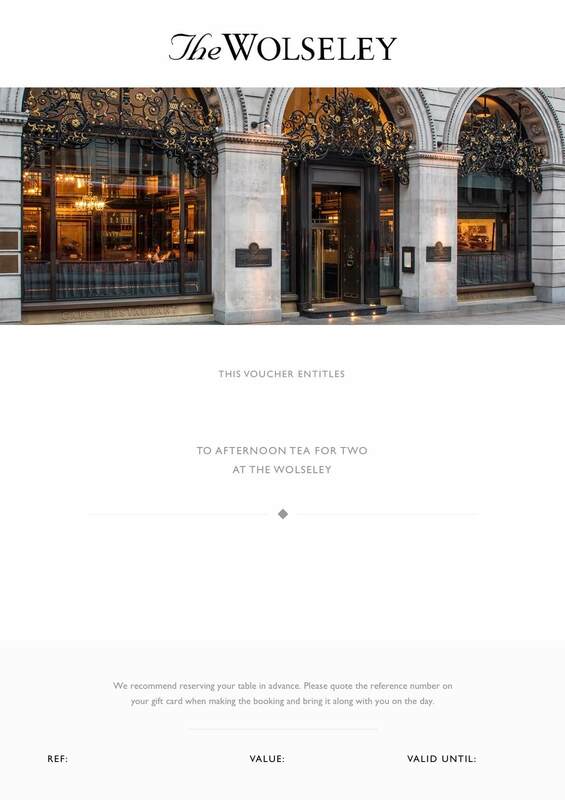 Please note that our Gift Cards and E-Vouchers are redeemable at The Wolseley, 160 Piccadilly, London only; they cannot be used when making a purchase from our online shop.